At Rivendell, we want to inspire a love for reading and develop confidence in writing and speaking. Our literacy curriculum allows students to be engaged and passionate about their reading and writing. Rivendell students use work sessions or Work Jobs (preschool) to practice literacy. Work sessions involve customized assignments that students work on independently or in groups. Work jobs involve manipulatives for specific literacy skills, guided by the teacher. Spelling and vocabulary work is also individualized. 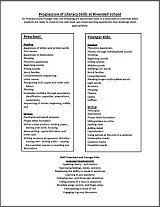 Middle and Older Kids use Readers and Writers Workshop, a unique curriculum model that incorporates mini-lessons with a focus on reading and writing daily, and time for independent work as well as sharing and feedback time with peers and the teacher. Students are engaged because they get to choose the books they want to read (learning how to select "just right books") and topics they want to write about. Instead of grades, the emphasis is on editing and revision, one on one feedback and creating kids who love to read and write. Students have daily opportunities to practice writing, from formal topic writing to free-form journaling. Every student at Rivendell, Younger Kids and up, keeps a journal that is personal to them and where they are free to write about their interests and passions. Other activities involve more focus on fine motor skills, spelling, punctuation and grammar, and writing in various styles and genres. Rivendell also teaches cursive handwriting starting in Middle Kids. Rivendell teaches a progressive curriculum of oral communication and public speaking skills. Preschoolers and Younger Kids participate in Class Sharing (show-and-tell). Students progress to sharing their own writing with their classmates (Author's Chair), giving regular topic speeches to the class (Recitations), and culminating in the 5th-grade speech in front of an auditorium full of classmates, teachers, friends and family. Rivendell has a literacy specialist that helps teachers and students with additional support when students are either struggling or need more challenge. Students also read with and get assistance from trained volunteers.